This is another recipe I tried last week after reading the recipe from a tamil magazine. It came out pretty well. 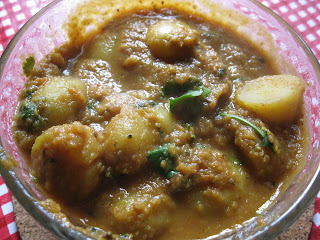 Check this out..
lovely looking dhum aloo. i love baby potatoes in dhum aloo. Looks yum and inviting ! After boiling and peeling the potatoes to fry them in oil, some of my friends actually deep fry the entire potato in plain oil. Gives another texture and richness.